Once the heart of Toronto’s indie culture scene, Queen and Spadina absorbed a wave of high-end retail in the early 2000s and turned from the place you went to get band bootlegs into the destination for designer boots. But once the hot new businesses chased the cool factor west to Ossington and beyond, Queen and Spadina emerged with its own unique identity: a low-key, comfortable neighbourhood in the heart of downtown, minutes to the more frantic traffic of University, Yonge, or the King Street corridor, with all the modern conveniences and self-assured personality anyone could want. With projects like SQ at Alexandra Park ready to open and select new rentals becoming available for May 2017, we’re bringing back our neighbourhood focus series and checking out the living at Queen and Spadina. A downtown neighbourhood is either drowning in choices for grocery shopping or desperate for them, but Queen and Spadina hits the balance with ease. For the more one-stop-shopping oriented among us, the Loblaws at Queen and Portland provides the local megalopolis of food, alongside a pharmacy counter, coffee bar, bakery, cheese wall, seafood counter, and a non-trivial organics section. Those looking for a higher end dinner can hit the Fresh & Wild at King and Spadina, which offers an organic produce section, fresh sushi rolls, deli and cheese counters, and a selection of the high-end green grocery products you’d normally find at a Trader Joe’s. With the office crowd hitting it for lunches every day, a significant chunk of Fresh & Wild is given over to ready-to-eat food, but if you’re looking for that very nice fair trade bottle of vanilla extract, they’re guaranteed to have it—and both stores deliver for a small fee. However, Queen and Spadina is also literal minutes’ walk away from Chinatown and Kensington Market, both neighbourhoods packed with small grocers, butchers, fishmongers, bakeries, and cheese specialists—and not limited to a gourmet price point. Being a Chinatown or Kensington regular is half preference and half voyage of discovery: Everyone who shops there has their own map of the neighbourhood, their own favourites and spots they’ve never tried before even after a decade of weekly grocery runs (and we’ll regularly throw down about which produce store has the best deals or freshest Ataulfo mangoes). Recommendations here are less about objective quality than the kind of fandom usually reserved for the Leafs or your favourite Star Trek captain. But there are a few objective bests in the neighbourhood, both old-school and new: Queen and Portland’s branch of The Healthy Butcher, which offers butchering and kitchen skills classes alongside their selection of organic-raised meat, charcuterie, and cheeses; Sanagan’s Meat Locker, a small-and-local-focused butcher shop with some of the best sausages, small-batch condiments, and staff expertise in the city; and Global Cheese, whose huge counter stock is only matched by their no-nonsense, big-family practicality and willingness to have you try something new today. Finding a drug store is also a simple matter at Queen and Spadina: the large Shoppers Drug Mart at Queen and Ryerson includes a passport photo service and an all-important Canada Post location, and is open until 10:00 pm nightly. The equidistant Shoppers at Queen and Beverley has all the same features, but makes it until midnight. Rexall partisans have a short walk east to Queen and University, where the store closes at midnight every night. Queen and Spadina used to be a bar and club neighbourhood, and you can tell from its food offerings: there’s a huge emphasis on the kind of quick, filling, delicious snacks you want before or after a night of dancing and beers—but grown up into an art form. Banh Mi Boys and Fresh Off the Boat both specialize in portable-yet-decadent sandwiches, tacos, and fries with an Asian feel. While the first brought Vietnamese subs back into the popular eye with ridiculously delicious ideas like five spice pork belly steamed bao, the second takes the concept and goes straight for the seafood: snow crab fries are a house favourite. Add in a local branch of The Burger’s Priest right across the street and the eat-it-with-your-hands box is well and truly checked. Up Spadina, though, there are the entire riches of Chinatown, including pho, dumplings, and the dinner most like a combat sport, hot pot. Celebrity Hot Pot on Spadina, just south of Dundas, offers a huge selection of meats, veggies, and broths to dip them in, as well as a station to mix your own dipping sauces and top up drinks without having to flag down a server. For the more tea-and-pastry-oriented crowd, Butter Avenue, one of the city’s nicest patisseries, is perched comfortably just west of Queen and Cameron. While it’s their macarons they’re known for—and they are very pleasant macarons—take time to try the tarts and cakes too. While it’s been a few years since Queen and Spadina was where you went for a blurry night of up-and-coming bands, beers, and warehouse movie theatres, turning residential didn’t wipe its creative community away. Some of the most venerable bar venues in the city—The Horseshoe Tavern and The Cameron House—host live music every night of the week, with the former focusing on rock and the latter on folk and roots. Farther east, at University, The Rex offers daily jazz sets; west of Spadina, Velvet Underground has reinvented itself from the goth-rock haven of the early 2000s to a DJ and alt-rock concert venue. The books world hasn’t moved too far from the intersection either. While it’s been years since the street in lit festival Word on the Street’s name meant Queen West, edges of that reader’s culture still linger in some Queen and Spadina institutions: local café-slash-institution Tequila Bookworm, just west of Spadina, lovingly maintains its wall of bookshelves alongside a craft beer and cider menu. Type Books is still selling frontlist a little west along Queen, at Bellwoods, with a focus on art, design, and literary fiction. But Queen and Spadina was always—and still is—a quiet centre for another creative culture: fashion. Alongside the ‘zines and music venues, Queen and Spadina was, not too long ago, home to a hotbed of independent designers—who set up shop right next to the fabric and fiber crafting stores that supplied them. Though some of the fabric and costume stores have shut down or moved online, the craft community still has some significant mainstays in the neighbourhood. Affordable Textiles and Queen Textiles are the granddaddies still standing of the Queen West fabric store strip, with piles of fabric and notions stacked high and a line on everything you’d need for a sewing project, whether it’s your first homemade pillowcase or a full-on ballgown. On the other side of the fiber arts spectrum, Romni Wools, just a short walk west past Queen and Bathurst, has all the yarn, knitting, and crochet tools you could ever dream of, and a healthy magazine, book, and how-to section besides. Queen and Spadina is still cheerfully reinventing itself, from punk paradise to fashion strip to outdoor mall to its current incarnation: a curious, liveable, creative neighbourhood that’s found a balance between all the lifestyles Toronto throws out there. 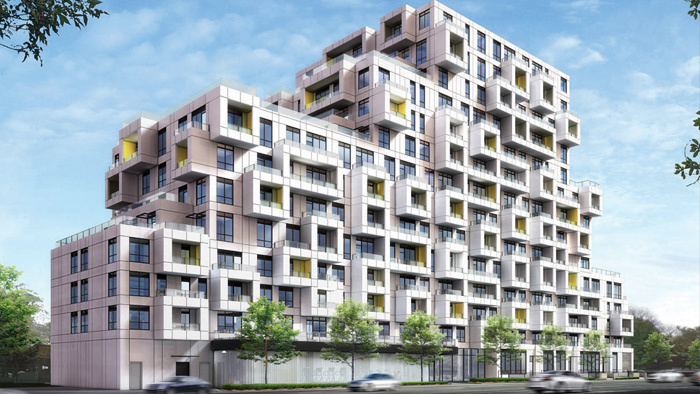 With SQ at Alexandra Park opening this spring, it’s a great time to take a walk through the Queen and Spadina neighbourhood, and to see if you’re going where it’s going next.